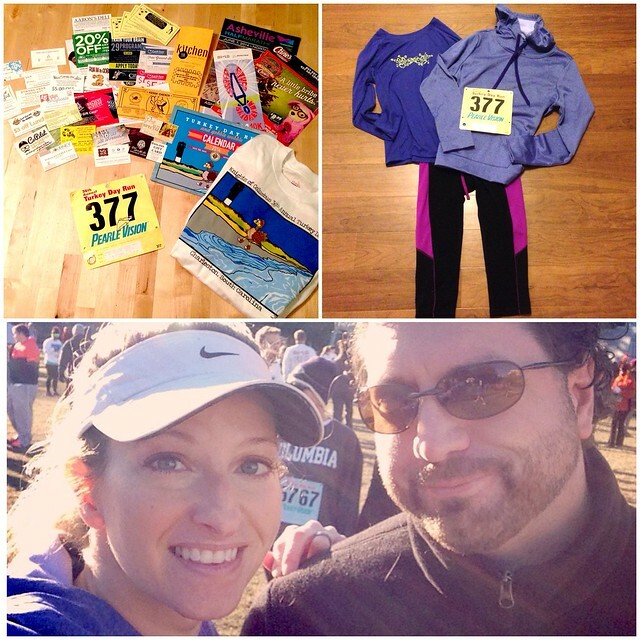 I ran my first ever Thanksgiving race this year and holy crap, it was cold! Unseasonably cold for here in Charleston at just 30 degrees! My thinned out Southern blood isn't prepared for that kind of cold anymore. It's generally been in the 50s and 60s here, which is just perfect running weather, but on Thanksgiving the temperatures nose-dived. I went into this race with no intention of even attempting a PR, or really even truly racing this race. I just wanted to run, end with a decent time, and participate in the biggest 5K in South Carolina. This is by far the biggest race I've ever run in with about 7000 racers. I was in the first corral, but really the crowd just never thinned out the entire time. And I didn't waste my energy trying to dart in and out and get ahead as I often do with other smaller races when I'm trying to PR. I was satisfied to start right in the middle of the first corral and just run. Overall, I'm happy with my race, even if it was my slowest 5K since the 2012 racing season. I ended up with a time of 24:49, so definitely slower than normal, but that's okay. I was feeling awake today and not tired (yay! ), but the cold made my nose run so bad and I was snotting all over the place the whole time. Hopefully, no one caught that on camera! My asthma also decided to act up a bit today around mile 2, likely because of the cold temps. I'm just not used to it right now and neither are my lungs. I started wheezing right before the mile 2 mark and didn't stop until about an hour after I had finished. So, that definitely slowed me down in my last mile (I went from 7:23 and 7:25 for miles 1 and 2 to 8:25 in mile 3), but I still pulled a respectable time and I can't really complain. Although, I did fail in my running without looking at my pace mission. Someday, I'll get around to doing that and see what happens. of coupons and discount codes for local businesses. I've never gotten a race packet this huge from any race I've run, not even the half and full marathons. There's also an after party with a beer garden inside the registration tent, plenty of post-race water and sports drinks, and helpful volunteers. We didn't stick around afterward because I had overnight eggs in the crock pot and we were anxious to get home and eat those (and get in from the cold!). My poor husband was an icicle after waiting for me to finish at the King Street wind tunnel. 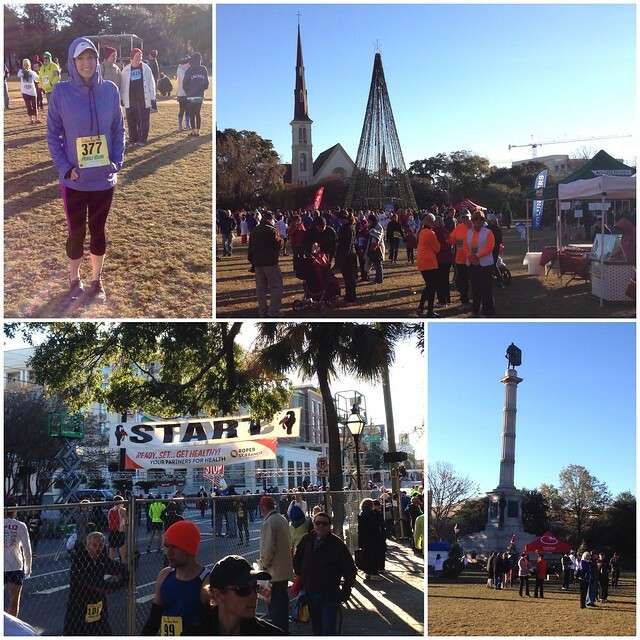 The course runs through a beautiful section of downtown Charleston, starting and ending at Marion Square, which is a wonderful park in the center of town and home to the Charleston Farmer's Market. The start is slightly downhill for a mile on Meeting Street while the finish is slightly uphill for the last mile coming back on King Street. I'd rather it be the other way around, but the inclines are pretty minimal. This is Charleston, after all, where the biggest hill is the Ravenel Bridge. I'll definitely be back next year for this race. It's just a nice way to start the day and kick off the holiday season with thousands of other runners who are also crazy enough to come out and run on Thanksgiving. Weather: 30 degrees, sunny, slightly windy, freeeeeezing!